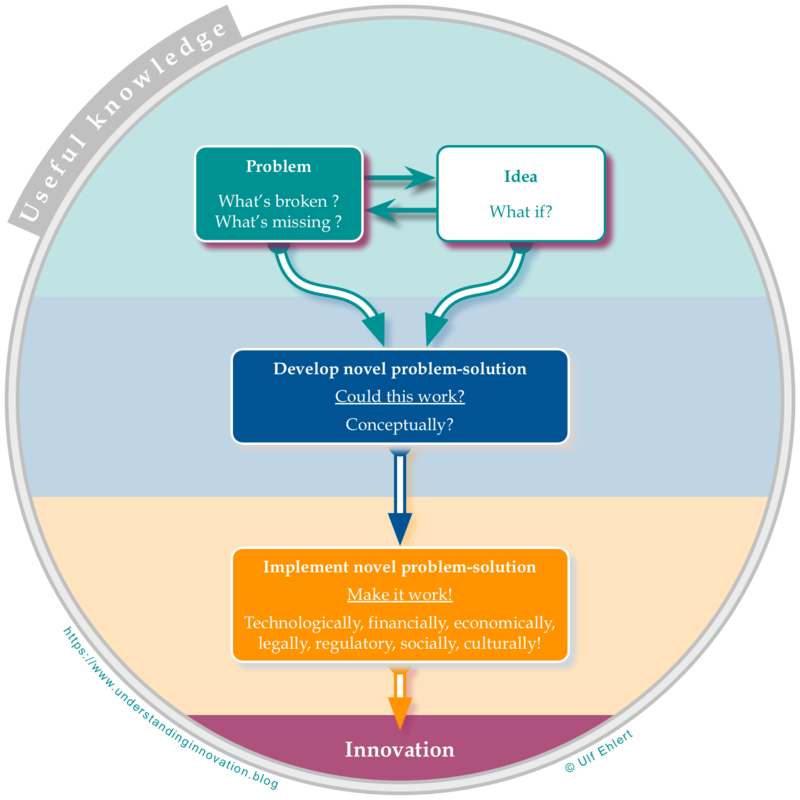 In the previous post, I introduced a graphical overview of innovation’s inner workings, embedded in a circle of useful knowledge that innovation draws from, and contributes to. That chart might create an impression of innovation as a messy, even unwieldy process. To highlight the structure underneath, today I’ll dissect it a little further. 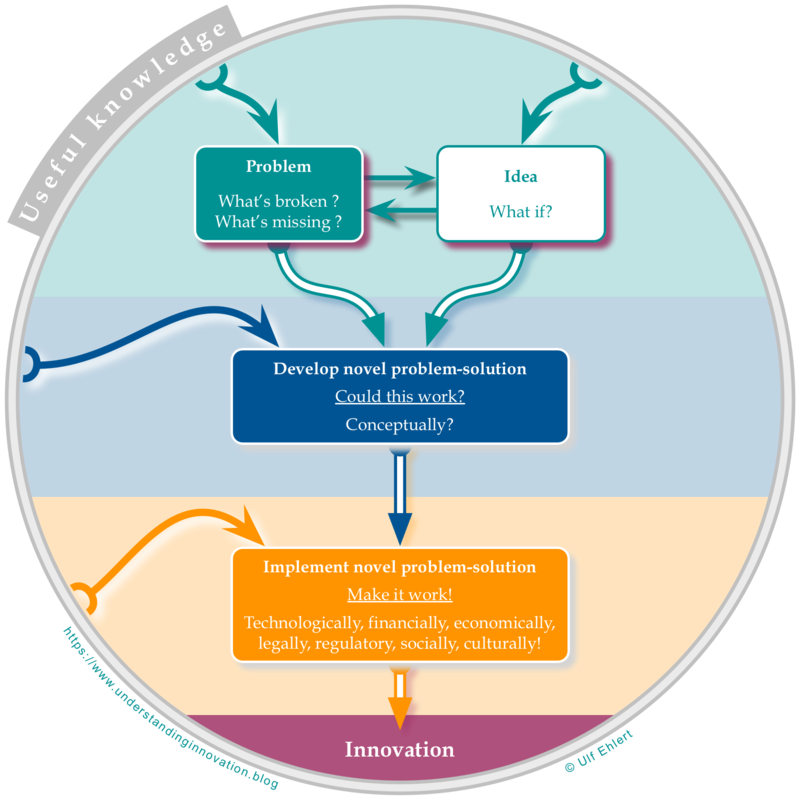 A simplified storyline of innovation, let’s call it the mainstream, usually presents a rather structured, linear flow: Somewhere between a concrete problem and an imaginative idea, the innovator develops the concept for a solution. He then matures the concept and addresses all the practical challenges to implement the novel problem-solution. Voilà, an innovation successfully delivered. While this storyline of innovation is not technically wrong, still it is simplified beyond repair. It ignores innovation’s dependence on existing knowledge; it misses innovation’s broad contributions to useful knowledge; it neglects the internal feedback loops that are at the root of innovation’s complexity. High time to do justice to these important characteristics of innovation, one by one. Considering the genius and inspiration of the gifted innovator as the sole source of innovation might be tempting, but it’s wrong. Rather, the innovator’s progress depends heavily on existing knowledge that is usefully applied to the specific challenge. Existing understanding of the problem, and promising ideas how to potentially solve it make for an easier start. Insight in previous successful and unsuccessful solution concepts will save time, and knowledge of general methods and tools for developing and maturing such concepts is indispensable. Finally, implementation success is more likely and will come faster if the innovator knows about past successes and failures, if he knows about existing methods and tools, and if he has insight in all aspects of the practical implementation of his novel problem-solution. The requirement for access to useful knowledge is actually daunting, and the successful innovator truly stands on the shoulders of giants. At the same time, innovation generates more useful knowledge than first meets the eye. The implemented novel problem-solution, that final result, is not the only useful output of all the time and energy invested. You will develop a deeper understanding of the problem, of what is broken, or what is missing. You will likely generate a number of ideas that do not easily apply to your problem, but they might be useful to solve other problems, for somebody else, later. And during solution development and implementation, you will learn about the specific innovation you are trying to deliver, as much as about general tools or methods that could be of wider utility. All that knowledge can become useful far beyond the immediate purpose of your specific innovation. And then there’s all the knowledge of what doesn’t work. Even if it’s no fun at all, I’m an advocate for documenting failures properly, so that future innovators do not repeat your failed approach, saving their time and energy. Of course, you might not at all feel like writing up your failed attempts. But it is an important contribution to the useful knowledge that other innovators will benefit from later. It sounds strange, but recording your failures is another way of lending your shoulders to others to stand on. Finally, innovation rarely follows the straight-line that the mainstream image suggests. Rather, innovation seems to progress erratically, taking one step forward and two steps back. At every stage of the innovation process, we make assumptions about achievable outcomes of the following stage. Once we move further along those stages, our assumptions are challenged and either validated or falsified. In case they turn out to be wrong, we need to reconsider our approach; most likely, we’ll need to turn back to earlier stages and redo part of our work. For example, while developing the solution, we might find out that our understanding of the problem is incomplete, or that the initial idea just wouldn’t work. The same might happen even very late in the process, during implementation. In extreme cases, what seemed to be almost finished could force us to go back to square one. These feedback loops can be thoroughly frustrating. But if you think about it, this feedback also keeps us honest. No matter where in the process you start (with a problem, an idea, or already developing a solution), you can and will go back if necessary: to test your building blocks and assumptions, to discard what doesn’t work, to salvage the pieces that work. And to carry on until you get the problem solved. Every individual innovation goes through this process to be successfully implemented. But not every innovation takes the same route. They may choose different starting points, follow different feedback paths, iterate more or less often, and so on. To give you an idea of the potential variety, I’ll go back to the innovation landscape and take a fresh look at each of the four characteristic quadrants there: How would a typical innovation move through the process sketched today? That’s for another post. Coming soon.